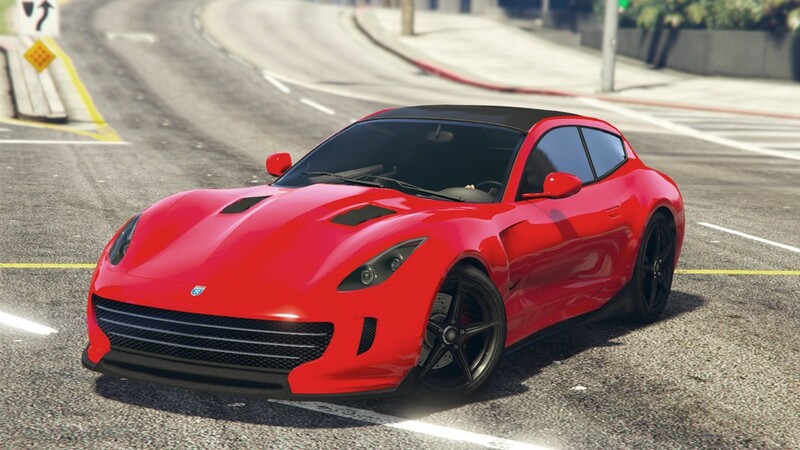 The Grotti Bestia GTS is a sports car featured in GTA 5 Online as part of the Further Adventures in Finance and Felony update. The sports car appears to take heavy influence from the Ferrari FF and Ferrari GTC4Lusso, seen heavily in the front grille design, headlamp shape, and overall body shape. The Grotti Bestia GTS appears with a black frontal trim centered between the two primary-colored front bumper panels which surround the large 3 element grille, containing chrome dividers. The hood can be seen with a bulge in the center as the two front arches curve up towards the A-pillar of the car. The rear of the car features a B-pillar also taken from the FF, where it makes the car a grand-tourer with a hatched-back design. 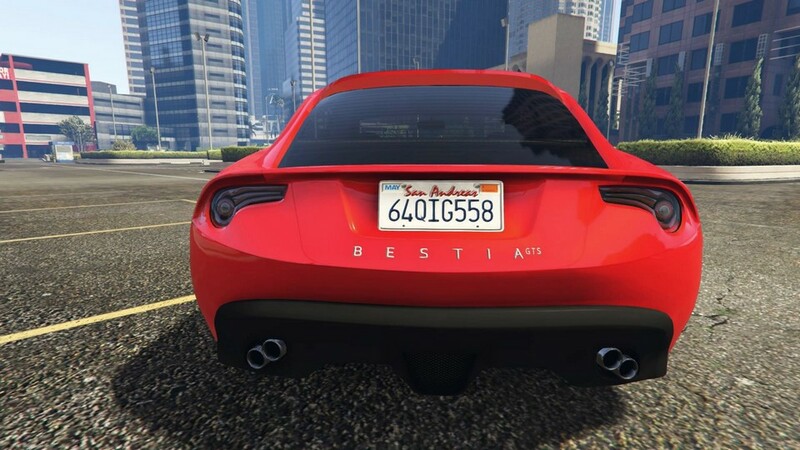 The taillamps of the Grotti Bestia GTS take influence from the Toyota 86. The roof features a carbon finish which leads up to the front pillars of the vehicle with the roof-line itself being painted in the primary color. A hatched window is found on the rear. The car’s performance is similar to that of the Grotti Carbonizzare, having above average acceleration and a very similar top speed. The car holds a rear wheel drive layout with a front engine. Its handling is also excellent, thanks to a nippy steering rack which has a large radius. The Grotti Bestia GTS engine sound revs high, which is also taken from the Grotti Carbonizzare‘s. The engine model appears to be a twin-cam 4 cylinder engine, which sounds more like a high revving V10 or even V12 Engine. The car has twin exit, twin exhausts popping through a carbon fiber exhaust housing around the bumper, with chrome circular tips. 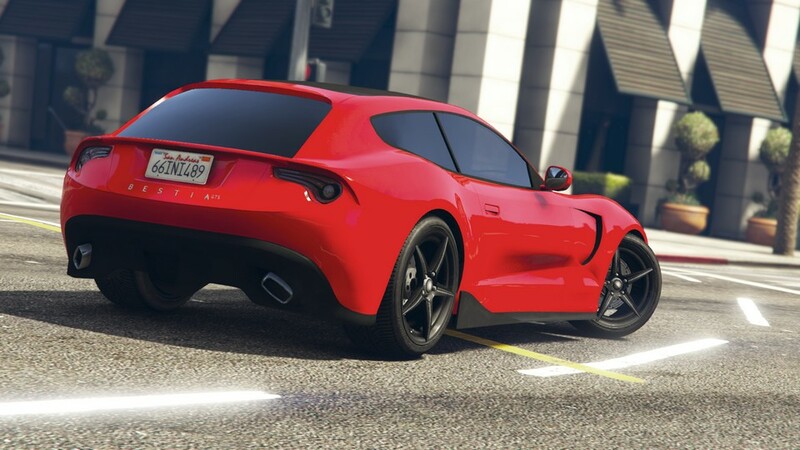 The Grotti Bestia GTS can be purchased for $610,000 from Legendary Motorsport.